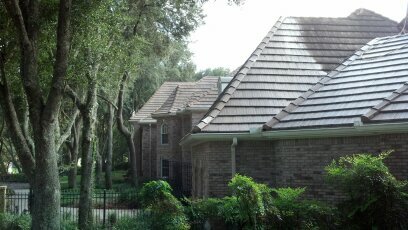 Tile roof cleaning of a large brick home with moderate roof algae growth. The Peerless crew was hard at work finishing up this large home in Tampa Palms this week. These tiles were very steep and required a complete blow off before the cleaning process. The tiles must have all sediment removed to clear the path for the solution. Did you lose a lot of plants from your last service? All the watering and tarps in the world won’t save your plants if this step is skipped. Peerless roof cleaners will blow the gutters and valley portions first to remove leaves and built up sediment. Once the large debris items are removed we spray our pretreatment mix of soaps to loosen the sediment built up on the lips of the tiles. This important step clears the path for the cleaning solution to get down to the root of the algae. If the built up sediment is left for the cleaner to remove, the tile will require too much of the solution adding unnecessary risk to plants. The key of this step is to minimize the amount of cleaning solution. Look at the bottom lip of the tiles and you will notice this built up muddy sediment. Once your tiles are free of sediment, only then are they ready for the cleaning solution. Peerless roof cleaning Tampa Palms utilizes an enhanced version of the tile roofing manufacturer’s recommended cleaning solution. We simply add a non-toxic soap to the mix to make the solution stick to the tiles like honey. This solution has been tested and approved by roofing manufacturers including the manufacturer of the Van Wezel Performing Arts Center for roof cleaning. The solution is applied in a minimal walking method. Man-lifts are often used but are not always necessary. 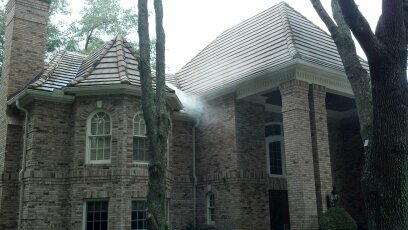 The Peerless Punch tile roof cleaning solution is applied with no more pressure than a soft rain. Lets face it, no matter how good your roof looks if all your plants die what good does that do for your curb appeal or your wallet? Peerless Roof Cleaning Tampa Palms will analyze your property and layout, and provide you with a detailed plant protection plan for your project. We will walk the property with you and through cleaning thousands upon thousands or roofs over ten years, we can determine what plants are at risk. Our roof cleaners will take every precaution to prepare and protect your landscaping from using tarps, to redirecting your gutter downspouts. The beautiful roof we leave behind has continues protection from the residual protection Peerless Punch provides. This will prevent any new growth on your Tampa Palms roof. Peerless roof cleaning is so confident in the effectiveness of our method we will provide you with a one year no mold warranty. 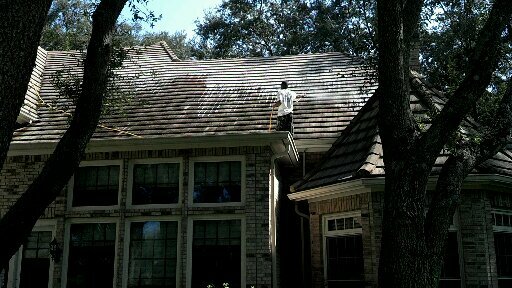 If any roof algae comes back within 1 year of service we will come back out and treat it again for free.